Category: Happy Wife, Happy Life! Last December 7th, Hans and I celebrated our fourth anniversary. Just like that, we’re on our fourth year! Four years. Wow. I know what some of you may say we’ve got a long way to go. And we do have more to learn. So much more to experience. So much to understand. But to still be married and in love with each other at this day and age for 4 years (we’ve been in a relationship for 7 years now- 3 years as bf/gf, 4 years as a married couple) is only through God’s grace. It was a beautiful day. What made it more beautiful was it was my rest day (suprisingly, and I believe it was God because I didn’t request for that day to be my off). Hans and I didn’t plan anything because we didn’t know my schedule yet plus no one would be left to take care of Seth. 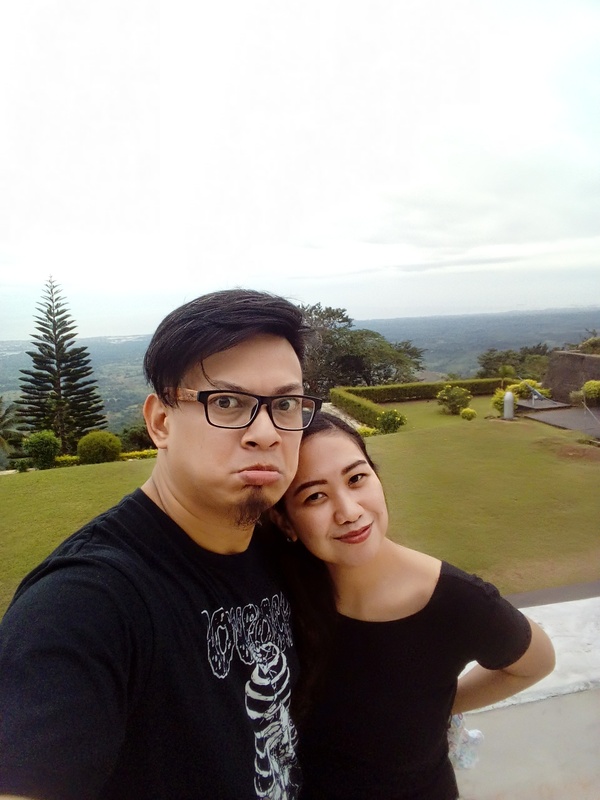 So when we woke up and greeted each other (which Hans did better btw, he woke me up at 12 midnight to kiss and greet me) we both decided to do a road trip and just go somewhere near. So we both did our research: we live in the countryside (Central Luzon) so South would be too far. 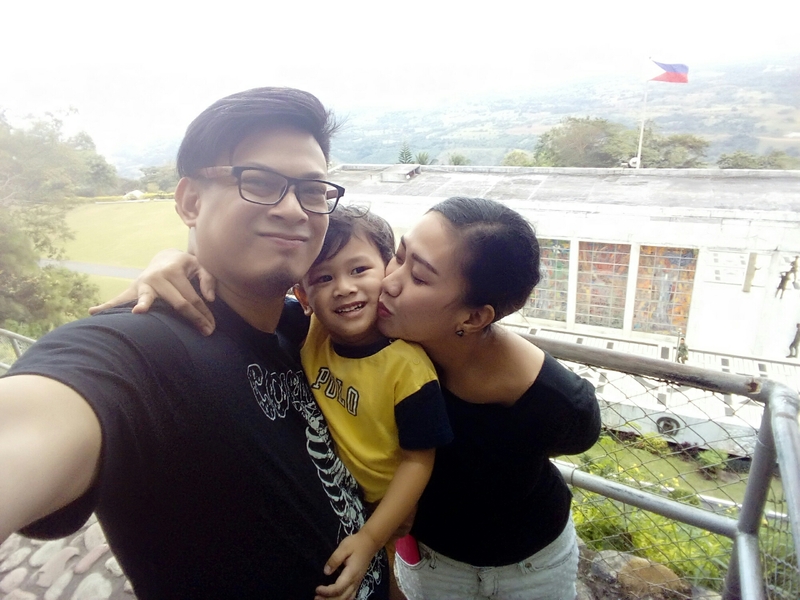 Hans said,”let’s go to Bataan!”. I of course seconded right away because anywhere with him is already a treat, going somewhere else is cherry on top (can I get an ‘awwww’, please? :p). Yep. Unplanned road trips are the best. 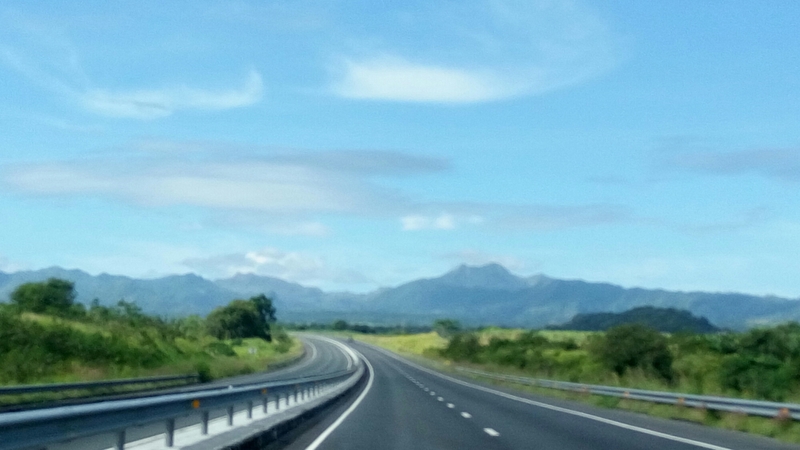 At SCTEX, my favorite expressway in the PH to date. One thing about Hans and I is that we both love history. We love going to museums, doing long walks (maybe that’s just me lol) and long talks (oops that’s me again). 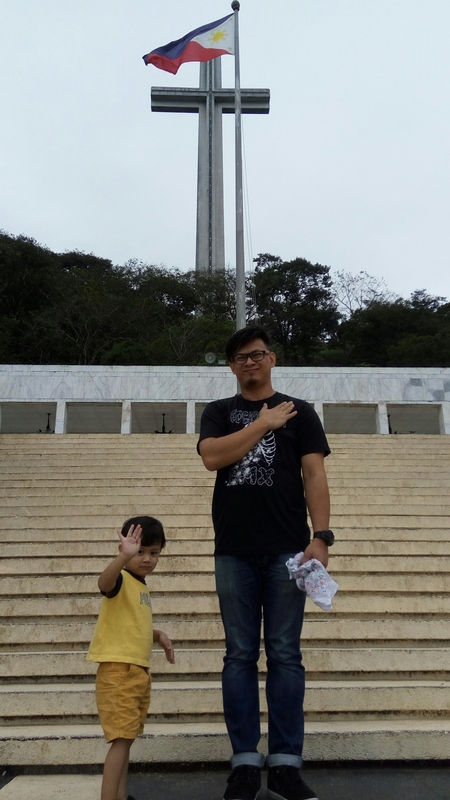 So first stop: Mount Samat National Shrine. 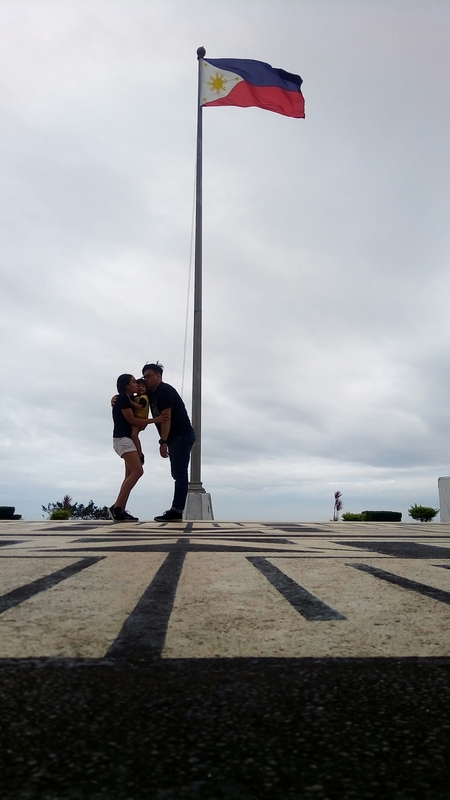 Mount Samat National Shrine (Dambana ng Kagitingan) is located near the Summit of Mount Samat in Pilar, Bataan, Philippines. 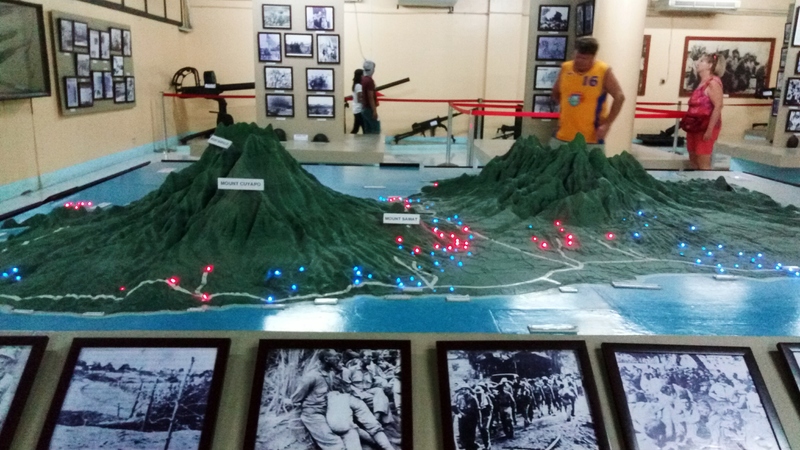 It was built to honor and commemmorate the Filipino soldiers who fought during World War II. Museums have this particular effect on people: they take you to where they want to take you. At Mt. 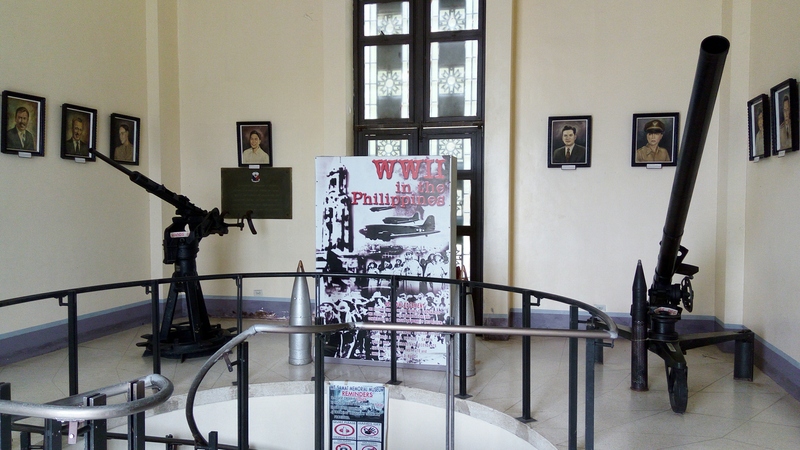 Samat Museum, I was taken back to war time. 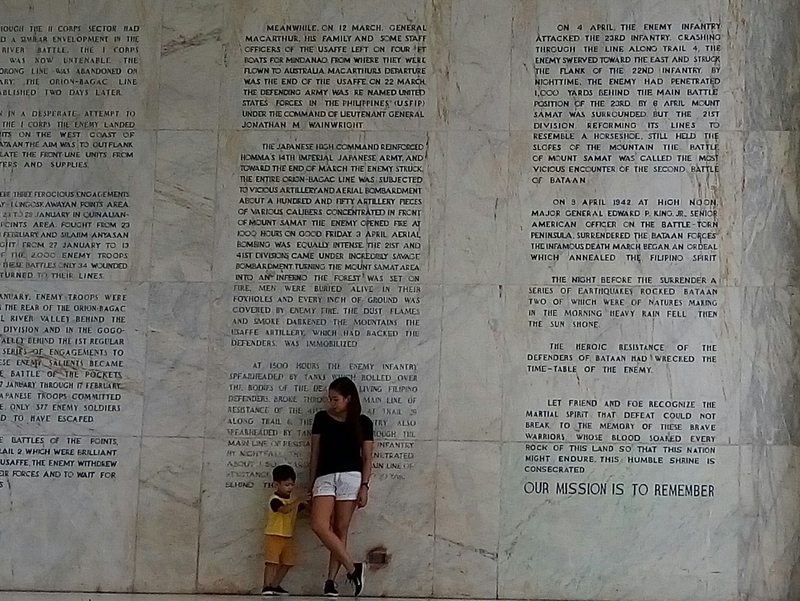 I felt chills (literally), and Filipino pride. It was an awesome moment and I was glad I got to share it with my boys. Outside the museum is a cross where you can go to through a lift. Unfortunately, when we visited, the lift was under maintenance so we weren’t able to use it. We attempted to climb going to the cross but because Hans and I are both afraid of heights, we climbed only until we can, and took a picture there. Oops.. Can’t go higher than that. Haha. 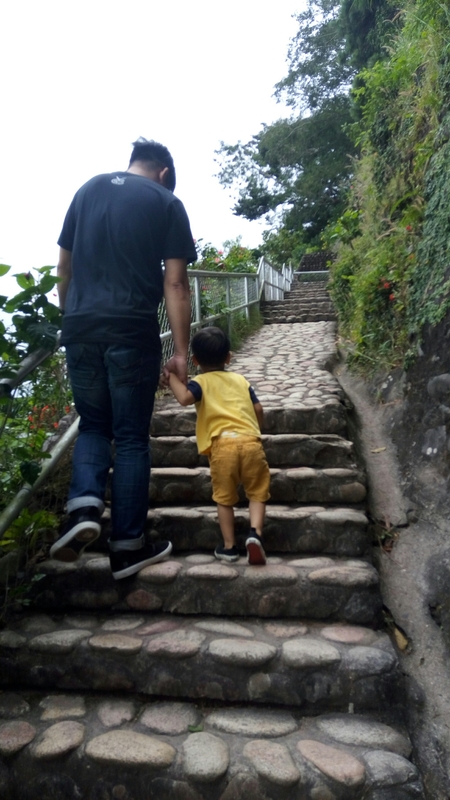 Feeling carefree with my mini me! But of course. A twofie with the hubby is a must! There are also shops around the shrine, as well as a field. 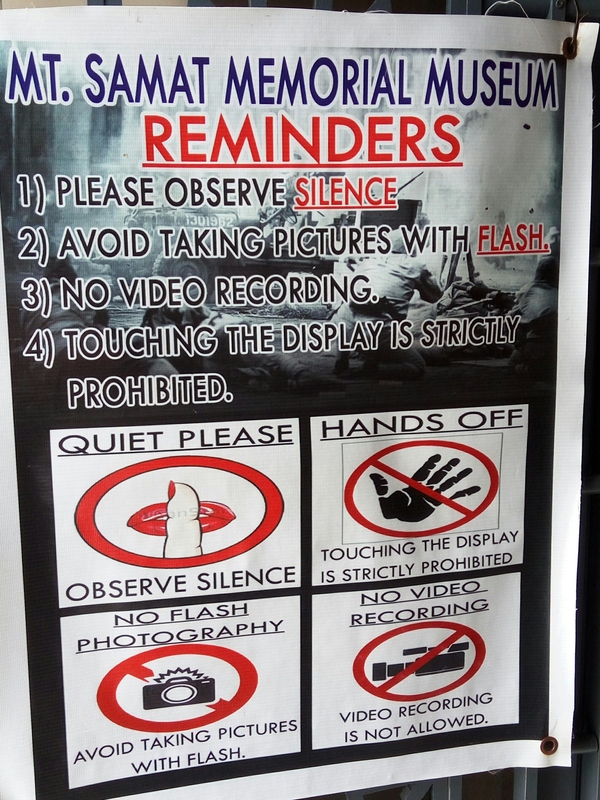 Entrance fee to the shrine is 20php/person. It is open from 8am-5pm daily. We arrived at the shrine around 11am so after our tour we were already hungry. Time for lunch! We used Waze throughout our trip. We had a little difficulty finding Loleng’s (although it can be found in Waze) because the streets were a little narrow plus there was a construction nearby. But we found it! Yey! We learned about this place from Byahe ni Drew. 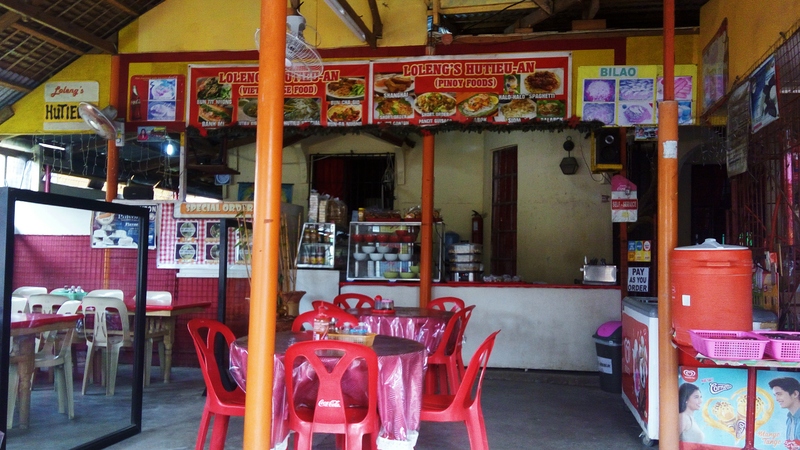 Loleng’s Hu Tieu-an is located in Barangay Binaritan in Morong, Bataan. 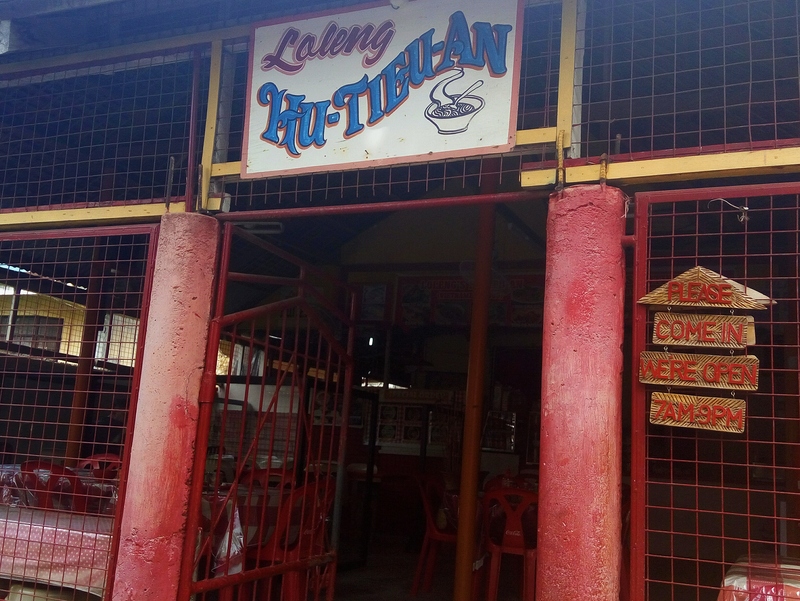 According to the television show, Loleng’s Hu Tieu-an is a humble roadside eatery run by a Filipina who used to work in a refugee camp. 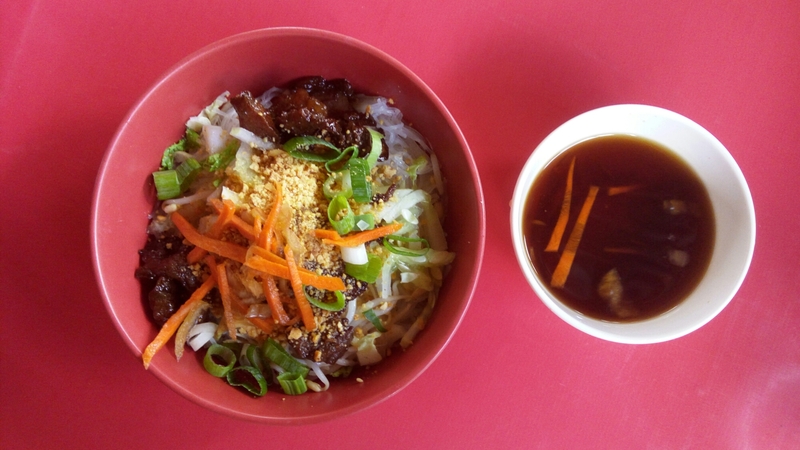 It has been delighting people with Vietnamese noodles for over 15 years. Loleng used to work at the Philippine Refugee Processing Center (PRPC), where she learned to cook Vietnamese dishes. 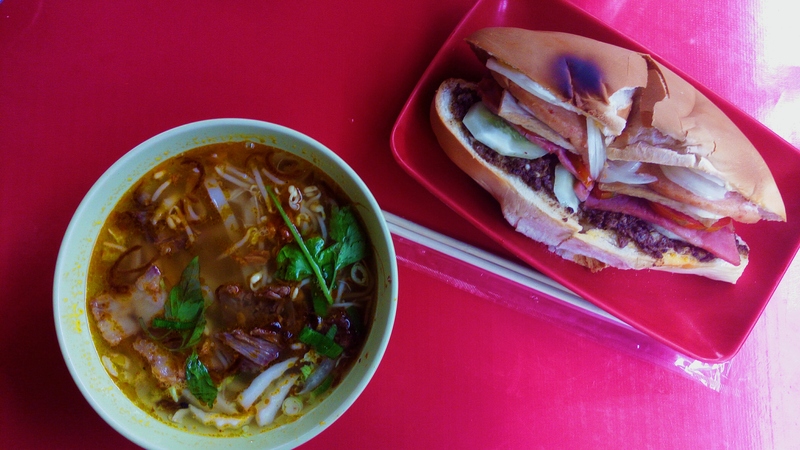 Her specialties are Hu Tieu, a savory noodle soup and Banh Mi, a traditional Vietnamese sandwich with meat and fresh basil. You may read more about Loleng’s Hu Tieu-An here. I ordered Hu Tieu, which they sell for only 50php! Aside from the Hu Tieu, I also ordered Banh Mi, which they sell for 35php. They used traditional Filipino buns instead of the French buns. It is good for sharing. I can’t really remember this, my apologies! It’s a salad with vegetables and meat, and it was good too! Aside from Vietnamese dishes, Loleng’s also serve Filipino dishes like Lomi, Pinoy-style spaghetti, shanghai, and pancit palabok. I tried ordering pancit but I was told they only come in big sizes (bilao) and that it would take a long time, so I just ordered spaghetti for the little one. 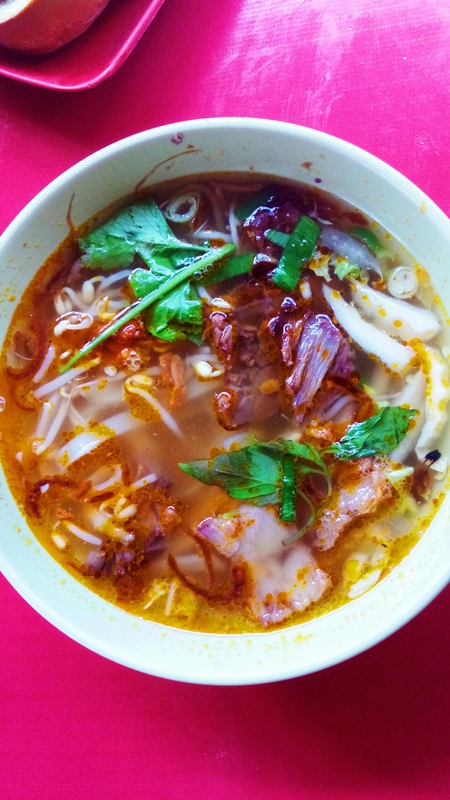 Loleng’s Hu Tieu-an is open from 7am am to 9am, everyday. After Loleng’s, we also stopped by Subic Bay (near the Subic Bay Airport), and we just gazed at the beach. It was beautiful. We also did a stopover at Puregold Subic, where we bought Seth’s favorite “teddy bear cookies”. Nothing beats watching sunset to end the day! We stopped by Clark Picnic Grounds for a while to watch the very beautiful (albeit fast) sunset that day. We were able to catch the sunset but only for a short time because it started to drizzle. That’s it! That was the most inexpensive, spontaneous anniversary celebration we’ve experienced. It wasn’t that extravagant, it wasn’t fancy.. But it was how we both wanted it to be: memorable, historical, and beautiful, like how anniversary celebrations should be. How do you usually spend your anniversary? Would love to hear your thoughts and experiences. Feel free to share! When you just want it to happen. When I was a child I wanted to change my name. This story cracks me up every time I remember it and to this day whenever I tell it to people I cry out of too much laughter (and humiliation, I suppose). Here’s how it goes: I was sitting beside my kindergarten classmate whose name is Jennylyn de Asis. For some weird reason I was soooo fascinated with her name that I wanted to change my name to hers. When I got home I told my mom (who was my pre-school teacher) that I wanted to change my name to Jennylyn de Asis. My mom, of course, in her delightful graceful composure, explained to me that we cannot have our names changed.. and so I cried. Like tantrums-cried. I recall my mom showing me my birth certificate, explaining that my name is my name and I cannot change it. There’s just no way. I cried and cried and did not talk to my mom for a week. I am not sure how it was resolved, I probably just forgot about it eventually. It’s funny how some of us assume that it’s so easy to change something – just like that. Or that we should get what we want because we want it so bad! This is a struggle for me, because I am so used to being a go-getter. Earlier my husband and I were talking and I was so upset and was pulling out a tantrum (it’s PMS time, ladies and gentlemen) because I wanted something to happen so bad. Well, first, it was me wanting something (a particular thing).. then me wanting something to happen.. then me fighting with him and then me resorting to crying and getting mad at him. And then I cried to the Lord. I was so upset and I was asking him “why, Lord, why? When? When will these things happen? Why are these things not happening?” Patience is not my best trait and most of the time I just lose it. My husband, being the patient, understanding man that he is, explained to me that these things- the things that I am mad about are not important. And that there are far more important things that should concern me. And that we should just trust in the Lord, know that He knows what He’s doing, and that we should not worry about these things because heck, He knows the future and He is God. Shouldn’t that give us peace? I was ashamed because I realized that I was too focused to getting what I wanted that I stopped focusing on the beauty of waiting (believe me, there is joy to it!). I focused on a very small aspect that I failed to see the bigger picture. I was ashamed because how could I not trust in Him? How could I worry? I try to justify my worrying to just being concerned but deep down I know that I was really anxious and worried. It’s normal to be worried and scared about the future but really, where would that take us? Remember Paul and Silas? When they were persecuted and imprisoned? Every month prisoners like them were being killed.. so what they did was pray. Not to get out of prison but to be extended on their imprisonment. You wanna know why? Because that is where they seek the Lord. Sometimes we are too focused on the things that we know would bring us comfort. On hassle-free, stress-free stuff. But if we seek the Lord’s presence there is enjoyment in the middle of a stressful life, it’s like we have our own life in the middle of these problems. A beautiful, peaceful life. Why do you have to look for a problem-free place when you can create a peaceful zone with God? It may not be comfortable but it is definitely peaceful. Oh how I thank the Lord that I have a husband like him! I know these words are not new words for me, or for anyone. But sometimes we really need to be reminded (and slapped in the face). When did I ever stop being contented over what I am blessed with? Our situation may push us to our limits (waaah, sorry Lord) but we can rely on the promise that He is God. Over whatever situation we are in. He is God over our families. He is God over our broken relationships. He is God over failed jobs. He is God over new adventures. He is God over new dreams. He is God over long distance relationships. He is God over this chaotic world that we live in. He is God. That alone should give us peace.